To make changes to a shape, you typically need to select it first, and for some types of changes, you need to select multiple shapes simultaneously. This topic describes several methods of selecting shapes in Quick Tasks. Note: If you are unable to select, move, resize, or rotate a shape on your diagram, it might be part of a locked layer. Use area selection by clicking and dragging in the page. Shapes are selected that are completely inside the rectangular area that is defined by where you click and drag the mouse pointer. On the Home tab, in the Editing group, click Select, and then click Lasso Select. 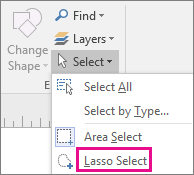 Drag a freeform lasso around the shapes that you want to select. Release the mouse button after you have surrounded the shapes. The lasso doesn’t need to be completely closed to select the shapes. 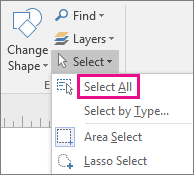 By default for both the Area Select and Lasso Select tools, each shape must be completely within the selection area specified by those tools to be selected. If you want more flexibility, you can also include shapes that are partially within the area. 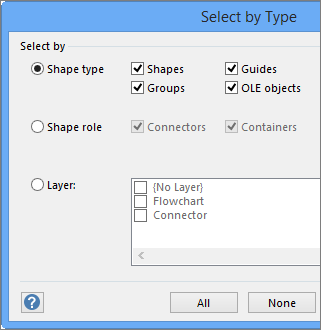 In Visio Options, click Advanced. 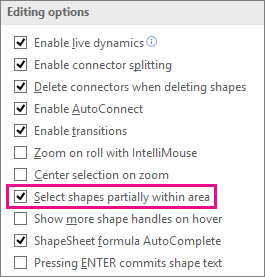 Under Editing options, select Select shapes partially within area. On the Home tab, in the Editing group, click Select, and then click Select All. On the Home tab, in the Editing group, click Select, and then click Select by Type. Click a blank area on your drawing, or press Esc. Press Ctrl and click a shape to cancel its selection.